Those who work abroad are often forced to leave their property unattended at home. Naturally, this creates a significant security problem. It is estimated that around 80% of all burglaries occur in unoccupied homes. Fortunately, technology offers a partial solution to the problem : remote monitoring. Thanks to broadband, mobile phones and email, it is now relatively cheap and easy to equip your home with a fully functional remote monitoring camera system to give you peace of mind when you’re away. Assuming you already have broadband, you don’t need any special packages or systems to set up a basic remote home monitoring system. At a minimum, all you need is one or more webcams and some webcam software. The two needn’t even come together. There is plenty of generic webcam software out there which will work with webcams from most manufacturers. Some of it is even free. 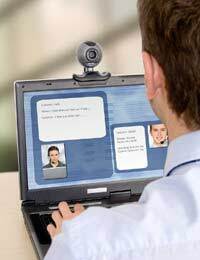 With basic webcam software, you will be able to see images through your webcam from a remote PC. Some software will also allow you to receive images or video clips through email or have them sent to your mobile phone or PDA. Stepping up in complexity, some software offers built-in motion detection capabilities, allowing you to detect potential intruders. You will be able to configure the software to react to these potential intrusion events. For example, on detecting motion, the software may capture a sequence of images or make a short video through the cameras, then send it to you via email or SMS. That way, if there really is a burglar in your home, you will have some nice mug shots to help police with their inquiries. Of course, if the message is received in time, and it does look genuinely alarming, you will be able to contact the police yourself and they may even be able to catch the thief in the act. Because of the danger of wasting police time through false alarms, most home monitoring software will not contact the police directly when the cameras pick up unusual activity. A human being has to decide whether the event represents genuine trouble. If you will not always be in a position to respond directly yourself, there are manned remote monitoring services which can do that for you, assessing the incoming data about a potential problem, making a decision about how serious it is, and contacting the police if required. Other hardware options are available beyond the basic wired webcam which you plug into your PC. For example, with wireless broadband being common nowadays, webcams which operate via Wi-Fi are often a good solution. Naturally, this greatly facilitates placement of the cameras at strategic positions around the home. Some cameras have built-in microphones so you can pick up sound, and some even offer infra-red modes for use at night. If you would like to monitor the area around your home as well as inside it, ruggedised cameras are available which should be able to stand up to Britain’s inclement weather. If building your own home-monitoring system from the individual components seems like a lot of hassle, you should consider one of the many pre-arranged remote home monitoring packages which are now available. These include both hardware and software designed to work well together out of the box. Naturally, this cuts down significantly on any configuration hassles. Some systems interoperate with your own existing broadband router; others will include their own. And if cameras aren’t enough for you, some remote home monitoring systems also include other types of sensor, such as smoke detectors or temperature indicators. If you want to keep a careful record of any unusual or potentially unusual events occurring in or around your home, just being sent images or warnings on an ad hoc basis may not meet all your requirements. Fortunately, there are online services which will allow you to access all your remote monitoring facilities and records through their website interface. The better-featured of these online services usually require a monthly subscription payment. Thanks to the proliferation of broadband, and cheaply available webcams, remote home monitoring is now an option available to everyone. I am live in uk. I have a home in Bangladesh.i want to install cctv or wifi cam in Bangladesh. which wifi cam or cctv cam is best to see from uk. I live in the uk, but i have a home in bangladesh and would like cctv cameras but dont know which is best to see on my fone even when in the uk and abroad.